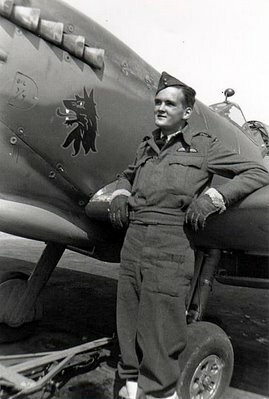 Another RCAF Spitfire pilot, this time Squadron Leader Hart Finley DFC. He is standing in front of his No. 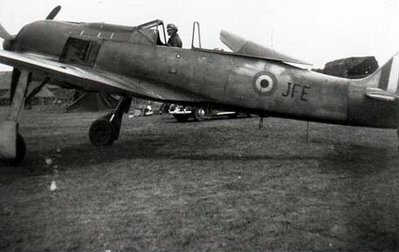 403 Squadron RCAF Spitfire Mk. IX during the summer of 1943. Finley went on to command No. 443 Squadron in April 1944 and remained in command until the end of the war. There is a notable error in the text. Finley did not lead the 443 until after the war. Wally McLeod was 443 Squadron Leader from unit formation until KIA in September ’44. Art Sager then got the 443 lead, if memory serves, and remained in command until the end of hostilities. Hart Finley was actually promoted Flight Leader in April or May ’44, and then Sqdn Ldr in July ’45, after VE.